An infographic of Frank Underwood's relationships that led to his rise as President of the United States. From college internships to becoming President of the United States, who you are connected to and how you leverage those connections matters. We wrote the post 4 sales strategy lessons from Frank Underwood to take some learnings from the show and how they can apply to your professional growth. It was an amazing use of social media that we got a response from the House of Cards Twitter profile and felt we should lean-in on some of the content. @linkedinselling Oh really? How fascinating. The first strategy is focused on 'Know and grow your network'. Selling is a team effort, and your network plays a significant role with successful prospecting. Become familiar with you individual network, then use TeamLink to find the best path to your prospect. You stand a greater chance of success with a trusted source introduction than by reaching out cold. 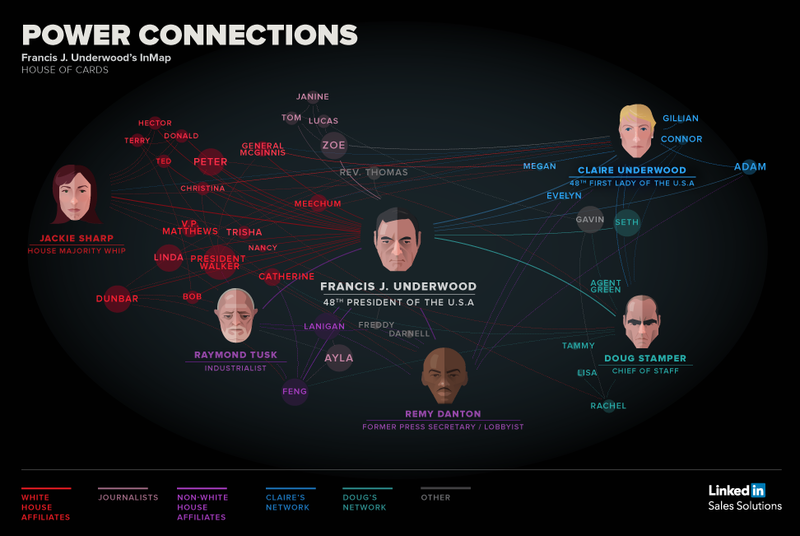 The best way for us to illustrate the valuable connections of a character like Frank Underwood is to create a LinkedIn InMap infographic with Frank at the center. Anyone familiar with House of Cards and the rise of Frank Underwood from Majority Whip of the United States House of Representatives to President understands that without strong relationships internally with people like Linda Vasquez the Chief of Staff, or external relationships like Frank had with Zoe Barnes the journalist, he would never have made the leaps he ultimately accomplished. Though the tactics used in the show are less than ethical in most cases, the message of how important relationships are to the success or failure of a persons' career are obvious. How are you leveraging your conections in business to build your sales pipeline?